I know I’m WAY overdue for a post. (And Adam- if you’re reading this, thank you for always reminding me to update my blog when you see me!!) I actually have a few recipes and photos that need to go up, but I’ve been having trouble with editing the photos. In the mean time, here are two recipes that I baked on Christmas that I’d like to share. Sorry that they’re bad iPhone photos and that I didn’t even photograph the steps! 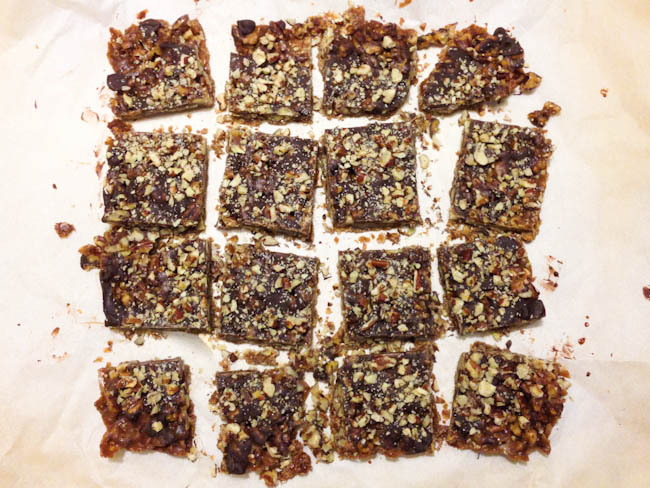 First up, Chocolate-Glazed Toffee Bars from Saveur. Originally found here. 1. Make the crust: Whisk flour, sugar and salt in a bowl. Add butter and using a dough blender, two forks, or your fingers, cut butter into flour mixture, forming pea-size crumbles; stir in milk until dough forms. Add more milk, if necessary, until dough holds together but is not wet. Press dough into a parchment paper-lined 8” square baking dish; chill 15 minutes. 2. Heat oven to 350°. Bake crust until golden, 25 minutes; let cool. 3. Make the toffee layer: Bring sugar, butter, honey, milk, and salt to a boil in a 2-qt. saucepan over medium heat. Cook until sugar is dissolved and butter is melted, about 3 minutes. Remove from heat; stir in 1½ cups pecans and the vanilla. Spread toffee mixture evenly over the crust; bake until toffee is golden brown and bubbly, 17-20 minutes. Transfer the pan to a wire rack; let cool 5 minutes, then sprinkle evenly with chocolate chips. Let stand 5 minutes, then, using a spatula, smooth chocolate into an even layer; sprinkle immediately with remaining pecans. Let cool completely, and then refrigerate until firm; cut into squares. 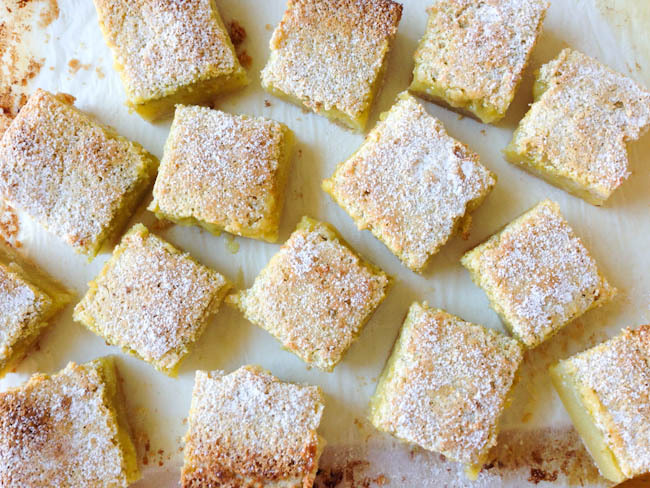 The second batch of goodies I baked were Lime Bars. I adapted the recipe just a bit, but it was originally found here. 1. Make the crust: Using an electric hand mixer, beat butter and granulated sugar until fluffy. With the motor running, slowly add flour and salt; mix until just combined. On a lightly floured surface; briefly knead dough until smooth. Using floured hands, press dough into a parchment paper-lined 9”x13” baking dish; chill 30 minutes. 2. Heat oven to 375°. Bake crust until golden, 15-20 minutes; let cool. 3. Make the filling: Whisk sugar, eggs, zest, plus the juice in a bowl until combined. Slowly whisk in flour until smooth; pour evenly over crust. Bake until the filling is set, about 30-45 minutes (original recipe said 30, but I needed much more time). Let cool completely, and then refrigerate until firm. Cut into squares and dust with confectioners’ sugar. Enjoy! Hopefully I’ll post my pending recipes soon!